The Owl Bar’s Bar Manager Joe Aldridge pours up some dark magic. All photos by Justin Tsucalas. The scariest things we typically encounter at bars are drunk, chatty old men and loud bachelorette parties. At The Owl Bar, located on the first floor the historic Belvedere Hotel in Baltimore, things are a bit more paranormal than your average neighborhood haunt. Opening in the city’s Mount Vernon neighborhood in 1903, The Belvedere has longstanding history as a playground for the rich and famous–including at least 10 U.S. presidents and countless celebrities. It’s no surprise that with over a century as Baltimore’s premiere venue, The Belvedere has more than a few ghost stories. When we’ve taken you Behind the Bar in the past, it’s to share the secrets of one of our favorite bartenders. 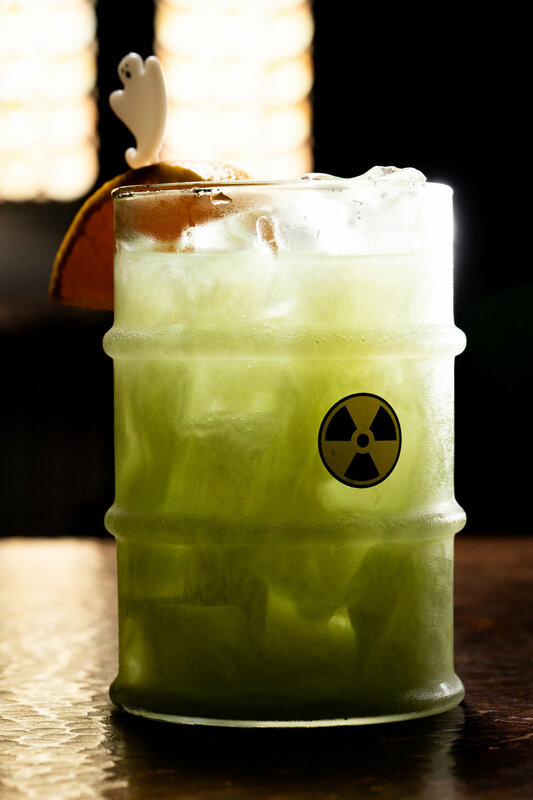 In this special Halloween edition, we’re sharing the secrets of the bar itself–and this bar (and the hotel it inhabits) definitely has some secrets. Read on to hear two longstanding employees of the Belvedere Hotel and The Owl Bar share their firsthand otherworldly encounters in the historic building. 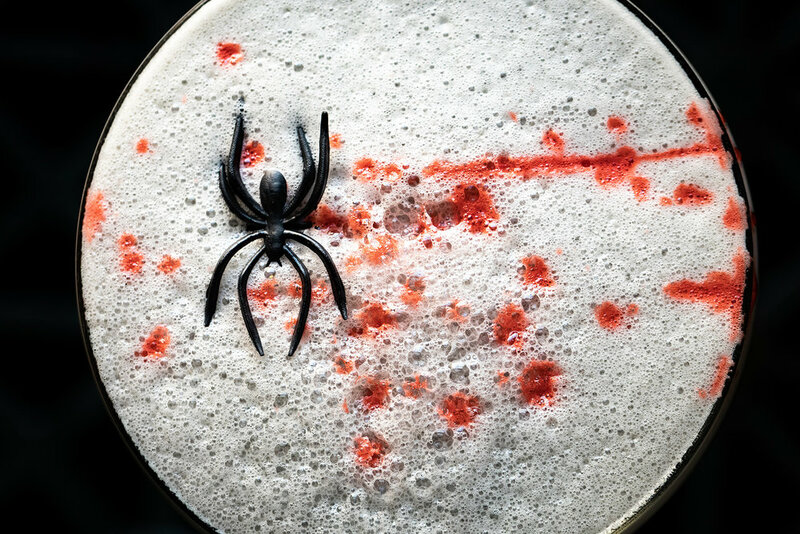 We’re also sharing two of The Owl Bar’s new spooky cocktail recipes, courtesy of bar manager, Joe! **If you’re in Baltimore, check out The Owl Bar’s Hollywood is Dead party on Saturday, October 27! What’s your favorite Owl Bar/Belvedere Hotel ghost story? Valerie (Belvedere Hotel employee): I have held many positions here at The Belvedere for the past 21 years, so I have many stories to tell. I was in the Grand Ballroom on the 12th floor getting set up for an event when I experienced the ballroom coming alive like it did in the movie The Shining. I could hear people starting to talk, and I could hear ice clinking in glasses as if drinks were being made. Then music started playing–but unlike the movie, I couldn't see any of it. I could only hear it. Jackie (General Manager, Owl Bar): I’ve been locking the restaurant doors at the end of the night (early morning) for more than seven years now–so I’ve seen a lot! My first encounter with a ghost was my very first month as the restaurant manager. It was myself and our bar manager at the time, Jeff, as we were doing some last minute cleaning before locking up. The TVs and the music were both off as we were about to leave. I was walking out of the kitchen, and out of the corner of my eye I saw a bright light in the corner up on the ceiling by the television followed by a huge SLAM! Jeff had his back turned to me as he was counting out his drawer and didn’t budge. I was shocked at what I had seen and heard, but I was more shocked that Jeff didn’t react to this god-awful noise. The hit was so hard that I swore it hit the floor and shattered it. The floor was in tact, the bright light I had spotted had disappeared, and Jeff was still counting his drawer as if nothing had happened. I was horrified and screamed for him to come from behind the bar. I explained what I had witnessed in detail. His response? “Sounds like you had your first ghost sighting here at The Belvedere.” Later on after we locked up, we reviewed the cameras, which show me crawling under the corner table to check the floors. I looked ridiculous! What’s your favorite spooky room or floor in the Belvedere? Jackie: The Grand Ballroom (12th floor). Rumor has it that a Baltimore woman in the 1920s caught her husband dancing with his mistress in the Grand Ballroom and shot him dead. His ghost, it is rumored, still haunts the ballrooms of the 12th floor, but it only bothers women. Once in a while, people who work up there swear that glasses fall to the floor and break with nobody nearby, or they put something down and a little while later it would be somewhere else.